Casio Cash Registers at Cash Register Store.com. Our PCR-1000 Refurb's are part of a large retail buyback. We therefore list them as a refurbished model. This cash register includes a NEW factory warranty. The PCR-1000 cash register has most of the features found in the CE-6000. 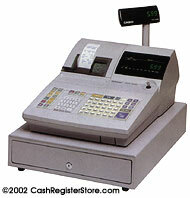 This is a great mid-range system for moving from the entry level cash registers to the high end cash registers. Some advantages of the PCR-1000 are easier programming then higher level models, large amount of department keys (30), alpha-numeric receipt and journal printers with validation and a full size metal cash drawer with a removable cash till. The PCR-1000 is a great buy for all that you get. All of these features are found on the CE-6000, but the PCR-1000 has them at $200 lower. Save your business some cash, and get one of these today.